Automotive HMI Market size is set to exceed USD 27 billion by 2024; according to a new research report by Global Market Insights, Inc. 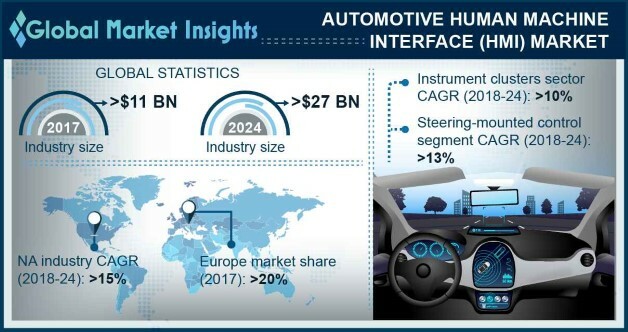 The automotive human machine interface market growth is attributed to the surge in demand for HMI technologies in the vehicle’s infotainment system to provide speech assistance, gesture & touch-enabled interfaces, web & mobile integration along with excellent user experience, and ease-of-use. HMI systems are widely used in automobile applications as a means of transmitting huge amounts of vehicle’s internal & external environment-related information to the driver, enabling smooth interaction between the driver and the vehicle. The growing penetration of smartphones and cloud-based platforms has also facilitated the seamless sharing of vehicle-related information by making use of various mobile apps. These platforms enable car-to-car communication and help the automakers to provide a wide range of services such as a personal assistant, on-board media streaming, and predictive maintenance services. HUDs are expected to show the fastest growth with a CAGR of around 21% in the automotive human machine interface market. HUDs help in reducing driver distraction by displaying warning signals and navigation information directly in the driver’s line of sight. The increased adoption of these devices to keep drivers focused on the road, ensuring their and the passengers’ safety will lead to its growing deployment in the passenger and commercial vehicles. In the global automotive human machine interface (HMI) market, the acoustic interfaces segment is projected to observe the highest adoption rate with a CAGR of approximately 15% throughout the forecast timeline. The increased implementation of the speech recognition technology to give the command or to control the features of the vehicle’s infotainment systems will accelerate the market growth. Among all the acoustic interfaces, beepers were the first to be used for warning functions such as speed limit, safety warnings, comfort feedbacks, and parking assistance. The passenger vehicle segment will lead the global automotive human machine interface market in 2024 with a share of around 75%. The surge in the production of passenger cars and the ongoing investments by the automakers to boost the autonomous vehicles market will drive the growth of the passenger cars segment. Increased customer demand for premium cars equipped with interactive multi-media systems is expected to trigger the growth of the HMI systems in passenger cars. The multimodal interface segment is projected to hold a dominant share of around 55% in 2024 in the automotive human machine interface (HMI) market. In smart vehicles, the infotainment systems work either on the commands of the user or programmed all by itself within the automobile. These systems can take inputs from humans in the form of voice, gestures, touch, and vision. The multimodal interaction in these vehicles helps in enhancing the user experience by enabling the user to shift seamlessly from one interaction mode to another. This also helps in minimizing driver distraction and ensuring driver’s safety by combining visual cues and audio through a single platform. The huge adoption of such interfaces in the new car models will fuel the growth of the automotive human machine interface market. The Asia Pacific automotive human machine interface (HMI) market is estimated to grow at the highest CAGR of over 15% during the forecast period. The market growth is attributed to the factors such as increased demand for luxury cars coupled with the rising disposable income in countries including China and India. Shifting consumer preferences toward luxury cars have compelled the automakers to adopt cutting-edge technologies in their vehicles to ensure high-brand engagement. The automobile companies in the region are also investing heavily in R&D to gain an edge in the development of next-generation vehicle technologies such as autonomous driving and ADAS. The companies operating in the global automotive human machine interface market are focusing on new product launches along with strategic collaborations and partnerships to leverage their mutual technological capabilities and create innovative service offerings. Some of the prominent automakers including BMW, Volkswagen, Bosch, and Toyota are investing in new technologies to improve the in-car experience and enhance the human-machine interface in the vehicles. The global automakers are also expanding their reach in the markets by establishing new production units. Such strategic initiatives will largely contribute to the growth of the market between 2018 and 2024. Some of the key vendors in the automotive human machine interface (HMI) market are Alpine, Continental, Altran, Bosch, Clarion, Denso, EAO, Harman, Nuance, Magneti Marelli, Luxoft, Panasonic, Socionext, Tata ELXSI, Valeo, Visteon, and Yazaki.